That is the tagline and vision statement for the National Oral Health Plan(NOHP) 2010 for Malaysia. Amongst the many lectures/sessions,there was one which was presented by the Oral Health Division of the Ministry of Health of Malaysia.Dr Choo Yoke Yuen,who is the Principal Assistant Director of Oral Health Division,presented an update on the NOHP 2010.The NOHP was initiated in year 2001 to improve the oral health of the nation and recently there was a review to track the progress and achievements of this plan thus far,hence the NOHP 2010 of Malaysia. I sat there listening to someone passionately sharing about objectives and goals of the nation to improve the oral health of individuals,from children to adults.She talked about successes thus far as well as goals yet to be achieved.Strategies to achieve these goals were mentioned. 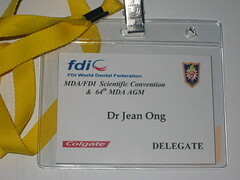 And for some moments there,I just felt a little sad.Here I was,in a convention hall with a small group of dentists,of whom I was probably one of the very few from the private sector.Most of those attending this particular lecture were from the public services.The rest of the world(ie private practitioners,were either attending another lecture running concurrently,or busy buying dental products from the host of dental exhibitors there).The Health Ministry may be achieving their oral health goals in the last 6 years and aiming for more in the coming years;but what are the dental practitioners in the private sector doing to help? By this I mean,there need to be a lot more done to educate the public and preventive measures done intentionally.Prevention is after all better than cure.There is still so many out there who are not aware of the importance of proper oral health care. 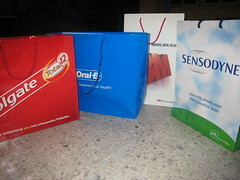 However,on a positive note,the general public are becoming more discerning and are increasingly willing to be educated about their oral and dental health.And parents are beginning to bring their children for dental checks at a young age,before any problem sets in.And children are generally being exposed to dental clinics and dentists at a younger age,where the environment is non-threatening.So,hopefully,we will have a next generation of people with not only much better teeth,but also not fearful of the dentist! Yay! As a general practitioner in dentistry,I do all kinds of dental treatment except those that require further speciality for example,I do not do braces but I refer my patients to the orthodontist who does it.I thought it would be good to mention the various specialities in dentistry.These specialists actually further their studies in their respective fields for at least 3 years or more,after they complete their degree in dentistry,in order for them to practice in their field of expertise and usually their practice is limited to their speciality ie they do not do practise fields of dentistry. Orthodontist – Dental specialist who treats and corrects crooked and misaligned teeth.They also deal with deformities of the face and jaw,and for certain cases,they will work together with an oral and maxillofacial surgeon(see below). Endodontist – Dental specialist who performs routine as well as difficult and very complex root canal procedures,including endodontic surgery and the treatment of traumatic dental injuries. Periodontist – Dental specialist who specializes in prevention,diagnosis and treatment of periodontal diseases. Oral and maxillofacial surgeon – Dental specialist who treats consitions,defects,injuries and esthethic aspects of the mout,teeth,jaw and face. Pediatric dentist – Dental specialist who provides primary and comprehensive oral health care for infants and children through adolescence,including those with special health care needs. Prosthodontist – Dental specialist who restores and/or replaces teeth and their associated parts eg dentures,crowns and bridges. Specialist in Oral Pathology and Oral Medicine – These specialists diagnose and treat oral conditions that require further investigation in the laboratory,for eg sometimes,tissue samples need to be taken for further tests. Whenever necessary, I would refer my patients to the particular specialist,for further invstigation and treatment. One year has passed by.ONE YEAR!!! It feels like I just got started at iSmile. It has been a fulfilling year for me,both as a dentist,and as an individual who wants so much to have a balanced family and work life.I still wish I can spend more time with my four kids though and it scares me to see them growing up so fast.Nevertheless,I am thankful for the current circumstances. Naturally,one year anniversary calls for celebration.I brought my team and their husbands for Brazillian food(apa tu???) at Bossanova in Parkroyal Hotel,downtown. The food was interesting.The buffet table had a large spread of appetizers and salads.The grill had 13 variants of meat and seafood,which was served at our table by chefs in their tall hats,holding HUGE skewers and knives. My fantastic team and their wonderful husbands! I think Johnny Depp is an actor par excellence.He is obviously a class above most of his fellow actors.Naturally I am an ardent follower of the Pirates trilogy and OF COURSE I have gone to watch the Pirates of the Caribbean 3,At World’s End. Director Gore Verbinski actually encouraged the cast of Pirates not to brush their teeth during the filming of the movie.Yikes!! He was quoted as saying,”I thought it would be more authentic to have pirates with bad teeth since I am sure they never floss.”That’s funny,because the cast were wearing fake pirate teeth.Mr Verbinski,STAY AWAY FROM MY PATIENTS! !